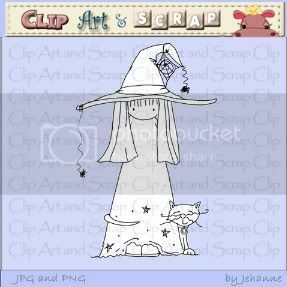 The Design Team members and I usedLittle Witch by Clip Art and Scrap. 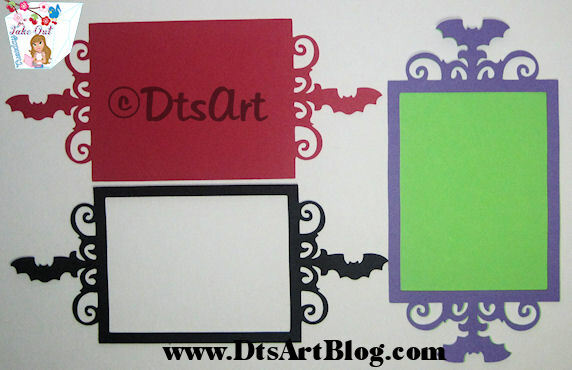 We also worked with Halloween Cuties Paper by Goodness and Fun. Be sure to check out all the designers at MyGrafico. I just want to get it out before you say hey you made that backwards. It isn't backwards in this house. Although my husband and myself are righties, 3 of our 4 kids are lefties. That's right half the population in this house is left handed. This actually went into my little girls lunch as a surprise and she is one of the lefties. 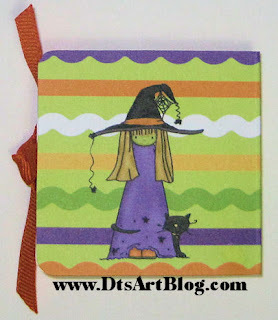 Isn't it cute, that little witch stamp is super cute. I used 2 pieces of card stock and printed each one with a pattern paper added the little witch stamp then cut it. I embossed the inside paper with the cuttlebug. Then I put the non printed sides together and glued. Before I sealed each side I placed a ribbon in each side. I cut a little strip of card stock and used double sided tape to hold the Reese's Cup and slide the Reese's Cup in. EASY-PEASY, WEASY! Hi Dandi Crafters, Happy Fall to y'all. Today's Take Out Tuesday is a Give Thanks title, perfect to get you into the fall spirit and give thanks for the abundance we have in our lives. The Give Thanks as shown in the sample above is about 5.6 inches wide. Both the SVG and SCAL Scut file are included in the folder as well as term of use and copyright information. I hope you enjoy Takeout Tuesday. Take Out is posted for my followers to download on Tuesday and Wednesday, on Thursday we throw out the left overs. We interrupt this regularly scheduled crafting to post to bring you the latest WHEW WHOO NEWS! 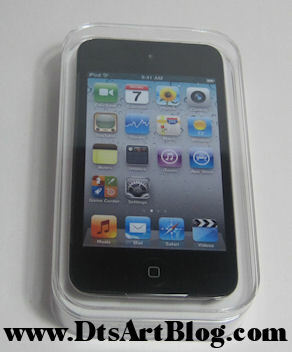 I got a new Ipod Touch! I LOVE IT!! 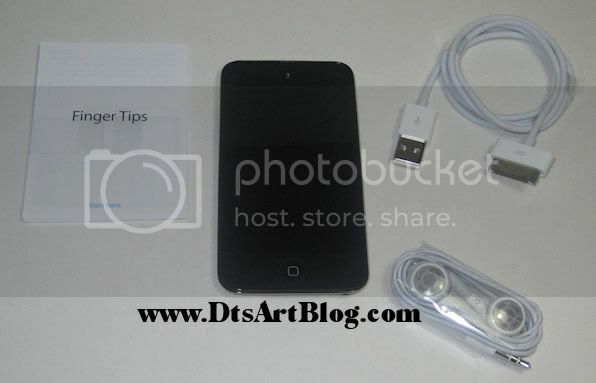 It is the great big Ipod Touch the 64 GB one. I started out with an 8GB and it was too small so I bought a new 16GB. That was better and I lived with for quite sometime. I was so bummed last year when they didn't do upgrades to the ipod touch other than update operating system. I watched this year with bated breathe that they would put not only a camera but video recording on it to. YES!! SCORE!! They did. I went right for the BIG touch this time. I finally feel like oh I don't need more room right off the box. The new design is so sleek and thin. It is just 5 credit cards/gift cards high. It takes pretty good high def video considering it is a touch and not a video camera. 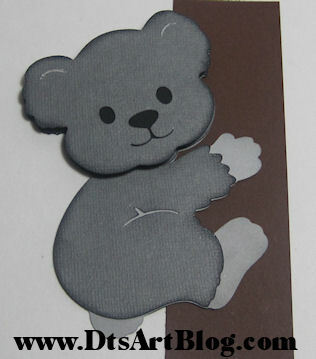 I am thinking about making a couple of crafting videos for the 'ol blog but we will see how it goes. Anyway along with having 400 songs on my ipod what impressed me more is that I have 5 full sized movies, and 82 TV episodes, not to mention tons of apps. All that and I still have a few GB left. I LOVE my ipod, I always have it near me. Well thanks for letting me share my exciting news! Hi Dandi Crafters! You'll Fall Head Over Hills for today's challenge over at MyGrafico Challenge Blog. For today's challenge we did some paper piecing. 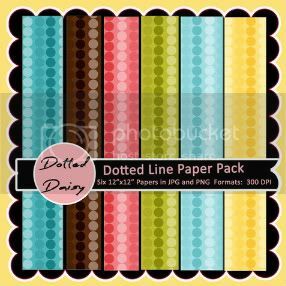 The Design Team members and I could be spotted using Dotted Line Paper by Dotted Daisy. 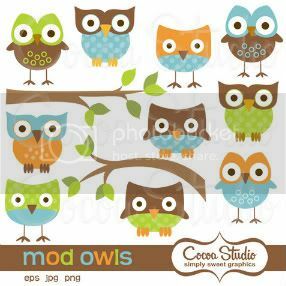 We also worked with Mod Owls by Cocoa Studios. Be sure to check out all the designers at MyGrafico. I saw this project over at Crafting with Class awhile ago and had been meaning to try it for sometime. I thought that this would be a PERFECT time to give it ago. It came out so cute. 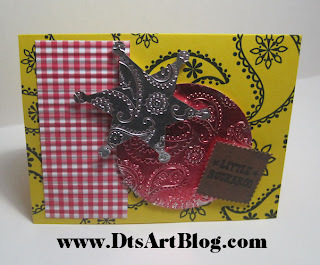 I really liked the aluminum foil from last week so I used it again this week for a tag and glued Whoo Love You to it. 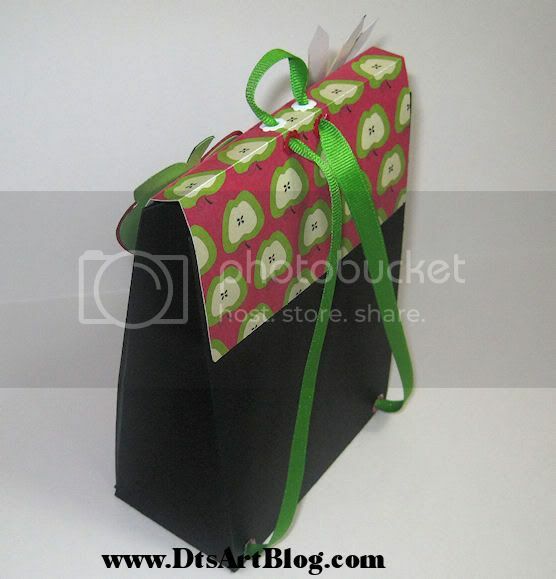 I love the color of the grosgrain ribbon. It looks really cute on the brown. I printed one owl out on white card stock and then cut it out in an scalloped oval shape using my Cricut Storybook Cartridge. I did the same with the brown scalloped oval. I used pop dots on each layer. I then cut out the top part of another owl and put it on pop dots. I cut 2 swirls from Cricut Solutions Cartridge Home Decor for fun accents. I did run my white card stock through the printer twice so I could have double sided card stock. I think the turquoise and yellow dotted line papers are a great contrast to each other. Are you wondering what is inside? Fall Treats of course. Yum! 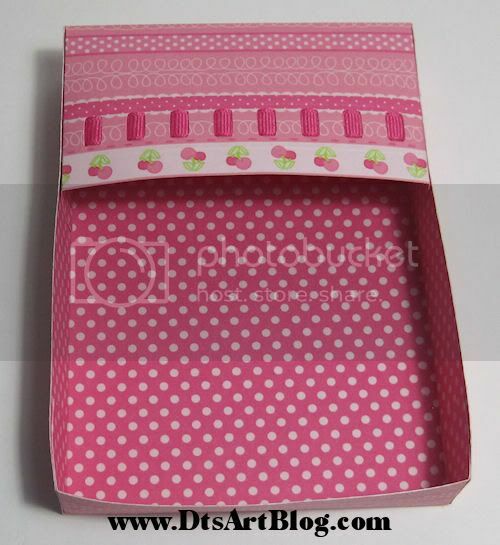 Be sure to check out Crafting with Class for great instructions on how to make this box! Hi Dandi Crafters! I hope you are all enjoying the 200 Followers Celebration and downloading all the past Take Out Tuesdays. Be sure to download them soon as they will be gone in just a couple of days. I post Take Out for my followers as a thank you. You can download it on Tuesday and Wednesday. On Thursday we throw out the left overs so if you are not a follower consider becoming one so you don't miss any Take Out. 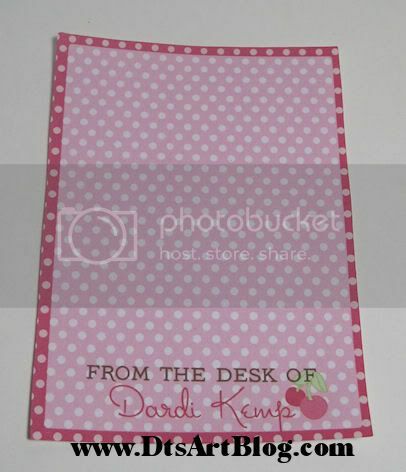 Hi Dandi Crafters! I hope you are enjoying the 200 Followers Celebration. My blog has been burning up with downloads, these past couple of days. A GREAT BIG thank you to all that took time to comment saying thanks and congrats, your post are much appreciated. I am really excited about reaching 200 follows. It has been great for my crafting ego...LOL While there is much downloading and merriment going on I didn't want to forget to say Thank you to Cyndi. She was a SERIOUS Cheerleader for my blog reaching 200 followers. The last oh 17-20 followers came much more quickly because she is such a great cheerleader. This isn't anything I asked her to do. She just went out and did it on her own. It is so nice of her to do that for me. She posted on a few big message boards how great my blog was and many popped over to take a look. Here is one such post where she was cheering for me. I knew I had to something equally nice to thank Cyndi. I saw on that post she liked Koala Bears, who doesn't really they are super cute, so I decided to make an SVG of a Koala for Cyndi. You get to enjoy the Koala Bear Download too, I am sure Cyndi won't mind! I hope you enjoy your Koala Cyndi. Thanks so much for singing the praises of my blog. I don't think I would be at 200 right NOW without you. In the sample above. I inked all the body and head parts in charcoal. I also add pop dots to the head to give it a dimensional look. I also put a black circle behind the head. That is not included. I am thinking every can come up with a circle on their own. LOL Also included in the folder but not shown, is a shadow head with no cut outs of any kind. 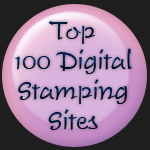 I know lots of people, me included, like to use stamps for the face. Whew! Whoo! 200 Followers Celebration! Thank you for joining in the celebration. Links are no longer available. Hi Dandi Crafters! 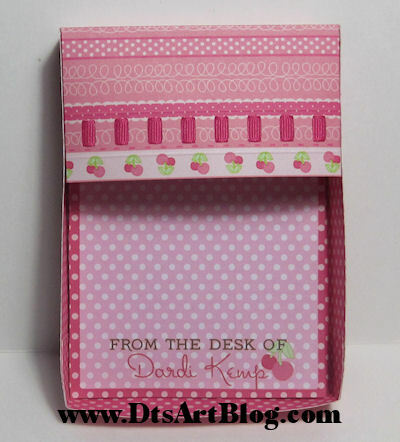 Today I am showing off this is oh so cute little schoolhouse shaped matchbook notebook. How cute is this!??! Too cute. Over at Fantabulous Cricut Challenge Blog they are having a Fantabulous Cricut Crawl: Button Up For School! I have been meaning to participate in a challenge over there for sometime but I have been so busy, but I decided to sit down and create a project to enter so I could participate. To participate you have to make a school themed project, use a Cricut cut, and include a button somewhere in the project. I decided to make another matchbook notebook. I had so much fun making the last one. This one is shaped like a schoolhouse. 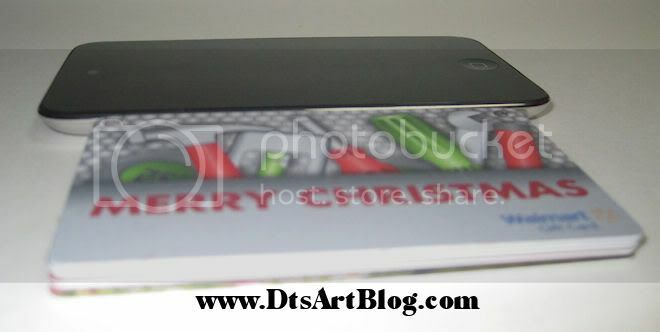 The notebook stands about 3.25 inches high and 2.75 wide. 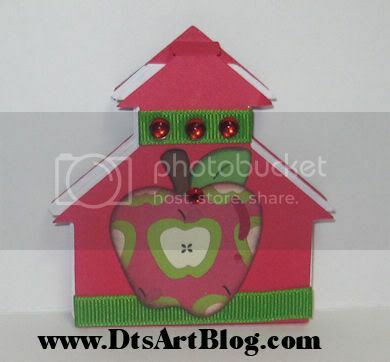 I designed a little school house in my favorite image editing program Paint Shop Pro. 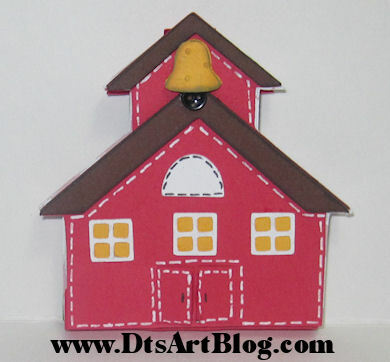 I used Sure Cuts Alot to cut out the little schoolhouse and all the school embellishments. I had so much fun decorating this little school house. It is a bit difficult to tell, but the roofs are on pop dots, as is the bell. Look at the bell it has a tiny button for the bell clapper. It add so much whimsy to it. I also cut open the tiny school house doors too. I then added faux stitching for more fun! If you pop it open you can jot down your little notes. The paper is shaped like a school house too. The matchbook notebook holds about 50 pieces of paper. I love how the paper turned out too. It has little apples all over it, so much fun. I had the pattern sitting on my computer for sometime and thought it would be perfect for this project. All the little pages are perforated for easy tear and share notes. The reason the pages have apples all over them is to continue the apple theme that is on the back. Nothing says back to school like an apple. The apple cut is from the Cricut cartridge Doodlecharms. I LOVE that apple. It is just the most darling apple. 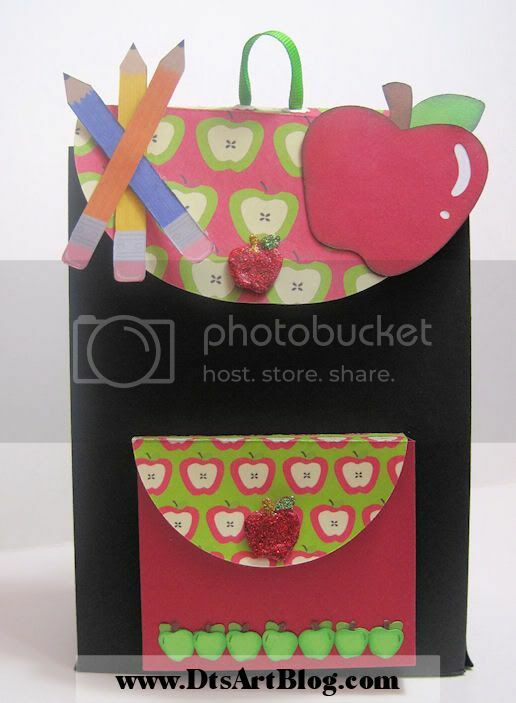 The apple pattern paper is by Cupcake Cutiees and is paper I had left over from this project. I also decorated the back with some green grosgrain ribbon and some little red bling.I think the back is almost as cute as the front. Make sure you pop over to the Fantabulous Cricut Crawl: Button Up For School to see all the great enteries. 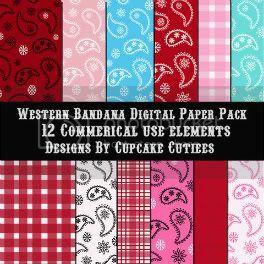 The Design Team members and I used Western Bandana Papers by Cupcake Cuties. 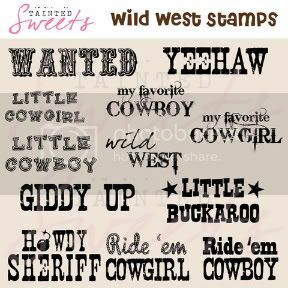 We also worked with a Wild West Stamps by Tainted Sweets. Be sure to check out all the designers at MyGrafico. I don't have alot of metal for crafting. If I looked around I probably have more than I think I have, but when someone says, "Use metal", I don't think, "Oh I have lots of that." What I always have is aluminum foil and last time I took chemistry that was a metal...LOL Don't believe me stick it in the microwave. Disclaimer: (Please don't really stick it in the microwave. It is dangerous. 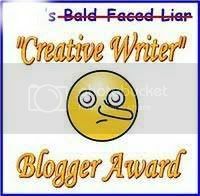 The disclaimer is there in case a moron happens by my blog. 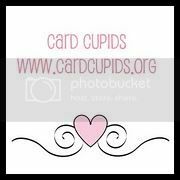 LOL hehehe) I glued some aluminum foil to card stock and cut the aluminum card stock out using my cricut. I made the sherrif's badge up on the fly, cutting it out using SCAL. The circle is just a shape that SCAL has in it. Next I ran it through the cuttlebug machine using the Perfectly Paisley embossing folder to give it some way fun texture. Wow did that liven up the aluminum card stock. I took the circle and stamped some ink on it. That was a fun effect. 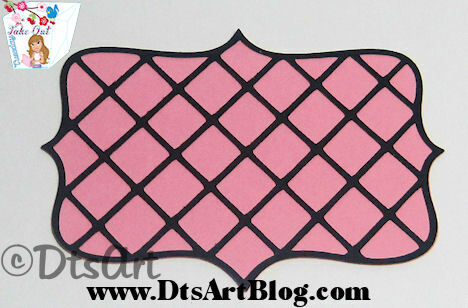 I then printed off some gingham card stock and ran it through the crimper. To me bandanna and gingham just go together. I have tons of gingham colors sitting on my computer. I don't buy gingham paper because gingham paper has to be the right size for each project or it looks out of place in a hurry and, two because gingham is so easy to make in whatever color you need it is really a waste of money to buy it unless of course it comes in a stack of paper. Lastly I used the cute little buckaroo stamp. Since it was a digital stamp, I dirted up the background with some grunge brushes I had. After printing it, I cut out the sentiment with the cuttlebug using the celebration stamps that came with it. Hi Dandi Crafters! Today for Take Out Tuesday I am continuing to serve up cute Halloween Fare. Today I have bat frames for you that are so cute it's scary. LOL There is a horizontal and vertical bat frame. There are lots of things you can use these bat frames for. Both bat frames have a frame and shadow layer that can be used separately making them even more versatile.They were created in SCAL 1 so the files will work in SCAL or SCAL 2. It includes SVG format so you can use it in Make The Cut too. Enjoy today's DtsArt Take Out. I post Take Out for my followers as a thank you. You can download it on Tuesday and Wednesday. On Thursday we throw out the left overs. Happy Halloween Dandi Crafters! I have my blog all decked out in it's Halloween Costume. Isn't it cute! I am certainly in a Halloween kind of mood lately. 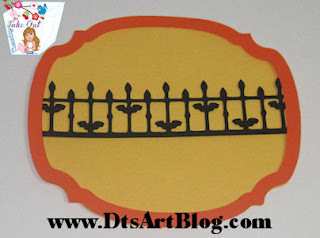 This week for Take Out Tuesday I had some Halloween Iron Fence Edge Punch SVGs,yesterday I changed my blog and put on it's Halloween Costume and today I am offering you a Happy Halloween SVG Title just for the fun of it. Hope you enjoy it. 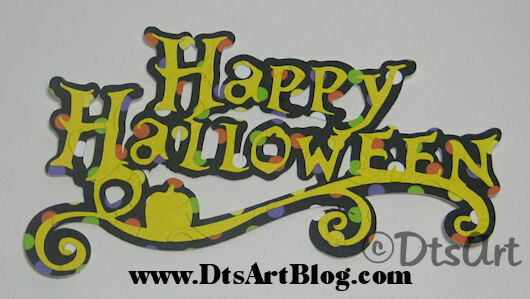 The Happy Halloween as shown in the sample above is about 5 inches wide. Both the SVG and SCAL Scut file are included in the folder as well as term of use and copyright information. Thanks for stopping by the ol' blog. 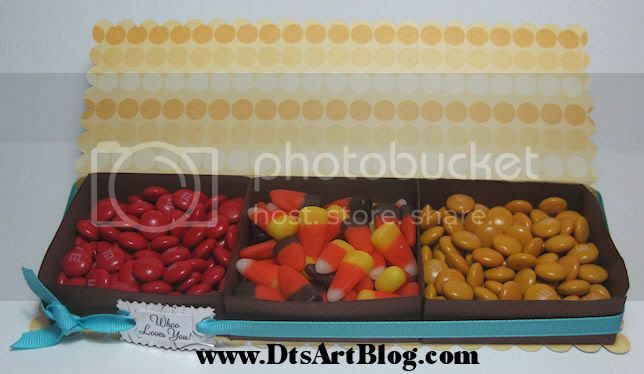 Since Halloween is fast approaching feel free to give me a little treat by leaving a comment. This is the front of a little beach party invitation. The inside contains the party details. 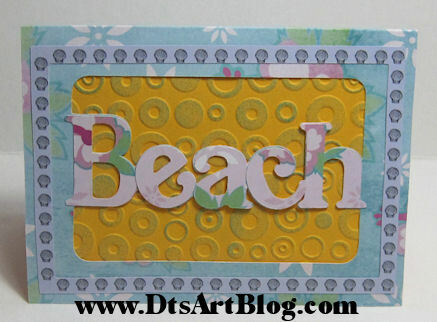 The card front has the beach word cut out in the blue hibiscus flower paper from Beach Time papers. I used my SCAL enabled Cricut to cut out beach on the invitation. I then cut out the word Beach in the pink hibiscus flower paper and laid them on top. I used a stamp shell from Pocket Full of Shells and repeated the pattern for a cute little frame effect. Since the card itself has a cut out I used some solid paper yellow card stock and ran it through the Cuttlebug Machine. I then added some turquoise ink to it for accent. Hi Dandi Crafters. You won't be on the fence with today's Take Out Tuesday's SVG Free Download. You'll jump to download it. We are getting you ready for Halloween with today's download. Today we have 3 edge punch type SVGs. We have a bat iron fence edge punch, a ghost iron fence punch, and a spider iron fence edge punch. They are too cute. Each iron fence was created at about 2 inches in height and 8 inches in width. 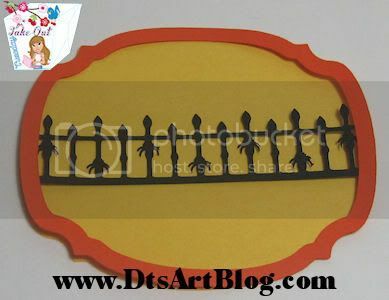 However I have test cut the all the fence files and successfully cut the fences at 1 inch high as shown in the pictures. The cutest size I thought was at 1.5 inches high. It just seemed the perfect size for the fence. Be sure to use a fresh sticky mat when cutting the fences as they have lots of intricate details to cut out. I hope you enjoy today's Tuesday Take Out. 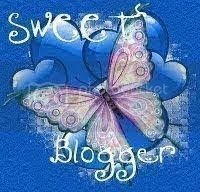 Thanks for following along with me Dandi Crafters. Hi Dandi Crafters! 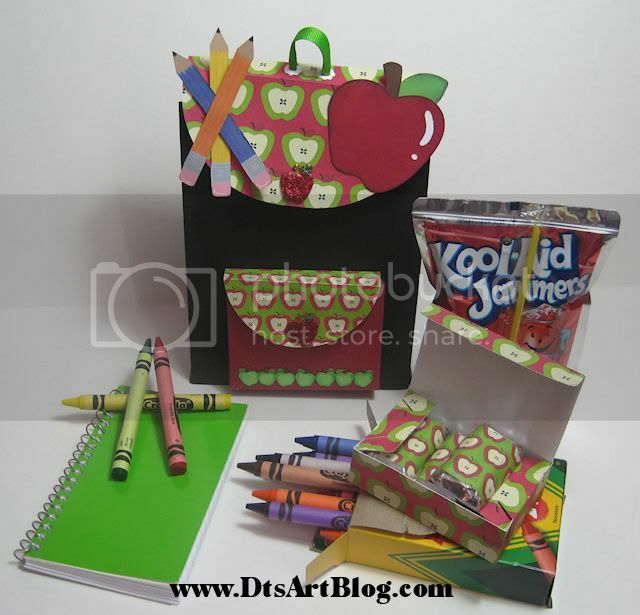 It is back to school time at the MyGrafico Challenge Blog. 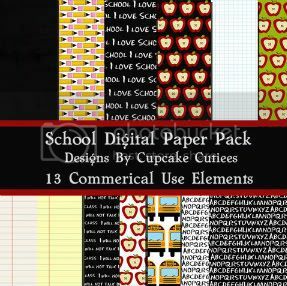 This week we got our inspiration from designers Cupcake Cutiees using School Paper Pack and Kelly Medina using Back to School Days Pop over to MyGrafico and see all the Back To School goodies. I decided this Back To School Challenge was perfect for a backpack. 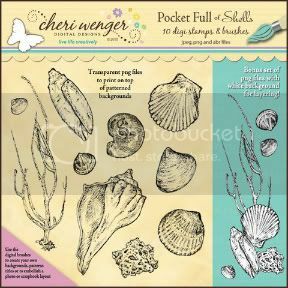 Splitcoaststampers has had tutorial for a cute backpack pack for a quite awhile. I always wanted to try it however when I looked at the tutorial a bit closer I realized that the finished project is quite small only about 4 inches high or so when finished. I wanted to be able to put somethings in my finished backpack so instead I decided to come up with my own version of the backpack. My backpack as shown here is about 7 inches high, 5 inches wide and 2.5 inches deep. My design also allows me to make it a bit bigger at about 8.75 inchs tall if I choose to I used my SCAL enabled Cricut to cut out the pattern after I drew it in my vector program. 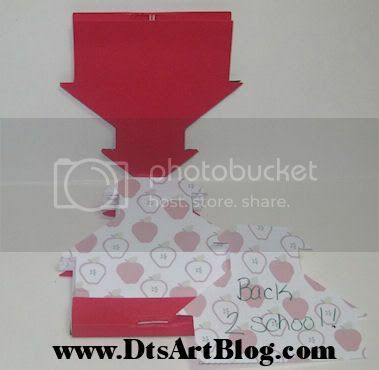 I used the School Paper Pack Apple Papers for the flaps and Back to School Days school pencils to help decorate it. All the apple die cuts are from Cricut Cartridge Doodle Charms. I love that apple. I took some apple grosgrain ribbon and used if for the backpack straps. There you have it one too cute, gotta take it to school backpack!